Although the shape of this vessel is more characteristic of ceramics from Henan and other kilns in the North of China, the body material and traces of finely crackled green glaze suggest a southern manufacture for this piece. A glaze of this type, which similarly displays a strong tendency to flake off the body, can be seen on vessels from kilns in Guangdong province, for example, the Shuiche kiln in Meixian (see Ceramic Finds from Tang and Song Kilns in Guangdong, Fung Ping Shan Museum, Hong Kong, 1985). 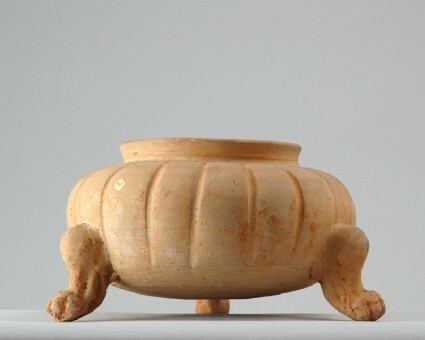 The vessel is of depressed globular form, with slightly flared neck, resting on three large feet in form of animal legs with paws clearly modelled. The sides of the vessel are structured by deep vertical grooves, which end at the lower part. The underside has a concave circular patch in the centre. The reddish-buff stoneware is now almost completely exposed, with only small traces of the olive-green glaze remaining in some of the recessed areas, but mostly flaked off, leaving only a faint matt layer which shows that the underside had been left unglazed.